I made hand warmers and lavender bags! Yes, this is the lovely tutorial from Paper and String, arent they the cutest!! Now I have to warn you, my pics arent nearly this good, but I was just too lazy to use the mini studio we have to take decent pics, especially as I made these at 3am, courtesy of Starbucks' wonderful Toffee Nut Latte which I had way too late in the day. 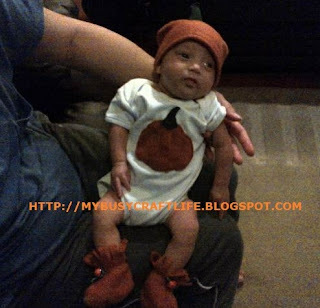 Halloweening - Baby Pumpkin Outfit - Pics!